Police have released an image of a wanted 22-year-old man, who escaped from custody at Worthing Hospital on Friday, sparking a manhunt in the town. Officers were patrolling in Worthing shortly before 12.30pm on Friday when they approached Jessie Burbridge from Hove, who was sought in connection to an assault in Brighton. Before officers could arrest him, he assaulted a police constable and made off from the scene, police said. However he was found hiding in a nearby shed shortly afterwards and was arrested. Due to complaints of arm pain, the suspect was taken to Worthing Hospital, where it was revealed he had a fractured arm, police said. But despite this he escaped again – while still handcuffed and before receiving treatment for his injury – sparking a manhunt around the neighbourhood. 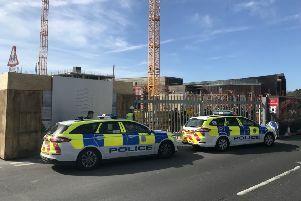 Several police cars and officers were positioned in Lyndhurst Road by the hospital, in the High Street and in the Waitrose car park. Officers were seen climbing fences and standing on roofs with a police dog unit, while a helicopter circled the area from above. At around 3pm the same day, a Lyndhurst Road resident was in her kitchen at home when a man jumped the wall, came into her house and ran through to the front door while ‘saying sorry’. She said: “I was really shocked. He was saying sorry as he came through my home. Police said Burbridge was last seen scaling a wall to the gasworks in Lyndhurst Road. Detective Inspector Clare Shiel said: “Despite the efforts of numerous officers and the police helicopter, we were unfortunately unable to trace Burbridge. “He was clearly determined to avoid us, but we remain determined to catch him. “We’re also concerned for his welfare as he has not received any treatment for his arm injury. "If you see him, please call 999 immediately. Burbridge is wanted for an assault in Brighton, and for escaping from lawful custody, assault and criminal damage in Worthing, police said.